First day to explore the temples of Cambodia. We all woke up around 9:30 and hurried down to not miss out on breakfast at the hotel, which ended at 10:00. I was not feeling good at all. The couch was uncomfortable and my cold, which remained in my nose, had also migrated to my throat and chest. I dazedly ate breakfast then got as ready as I could, not having showered in 2 days, and we headed for Angkor Wat. us inside where we saw thousands of people swarming around Angkor Wat. We couldn’t find a guide to take us through so we moved on to Angkor Thom, which is a larger but less famous complex of temples. The first temple we walked around was Bayon, and it was much larger than we had expected. We climbed up a very steep and slanted, original, staircase to get a higher view where we could see almost the entire structure. There were faces with different expressions carved into the tall pillars at the top of the temple. The variety of artwork was amazing here, especially since the traditional Egyptian hieroglyphs, while still stunning and amazing in their craftsmanship, were all mostly standard images. People were depicted in the same style with the same expressions etc. 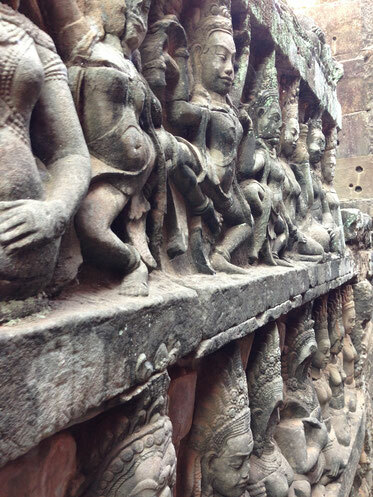 While in the Cambodian temples there was a great variety of people and animals all depicted differently. We made our way up another set of wooden stairs, these ones not original, to get to the center of the temple. It was pretty crowded with tourists and we all ended up getting separated as we explored. After about twenty minutes alone I found Amy and Michael. I went with them inside the center of the temple where I took off my shoes to go into a small shrine where a statue of Buddha was surrounded with incense and flowers. It was rather dark but people sat around the statue praying or meditating in silence. On my way out Amy was on her way in, she missed a step and fell in. She seemed to be fine but I never know quite what to do in those situations. I obviously made sure she was ok but did so in an awkward whisper, as to not disturb the people in the shrine. After maybe an hour of exploring this temple Michael, Amy and I started to make our way back to where the tuk tuks were waiting. On the way out we bumped into Lee and Adam so the five of us went to the tuk tuks, thinking maybe Mary would be there waiting for us. She wasn’t, so Lee and Adam decided to circle around to try and find her. 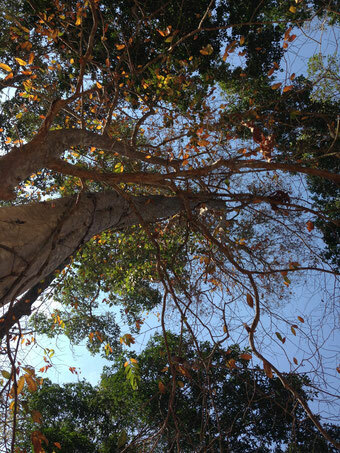 It was the afternoon in Cambodia and the heat was wearing on us. Drenched in sweat, dehydrated and quickly burning out, it was easy to think she might be a little delirious. While Amy, Michael and I waited at the tuk tuks Amy discovered she had lost her wallet. $500 cash, credit card and her drivers license all missing. Amy decided to go back into the temple with one of the tuk tuk drivers to try and find her wallet, while I waited with Michael at the tuk tuks to see if Mary, Adam and Lee would arrive. I had guzzled down an entire water bottle, which thankfully was for sale near by, before everyone had made their way back. Fortunately we had found Mary, unfortunately, not Amy’s wallet. So Amy went with one of the drivers to the police station to file a report while the rest of us continued on to see more of Angkor Thom. We saw two or three more temples, with varying landscapes and architecture. Baphuon, had elaborate walkways and high towers, which could only be reached by very steep steps that more closely resembled ladders. On the far side of the temple was an enormous reclining Buddha, which Adam was able to spot before the rest of us. 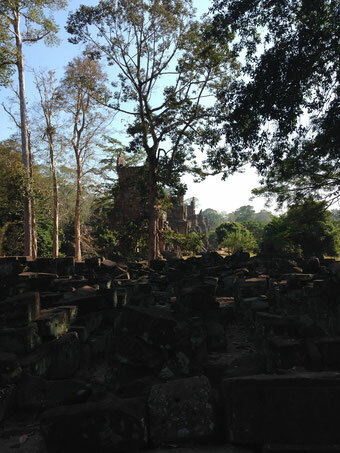 We saw a few more temples, which I didn’t get the names of, as we made our way though the dense jungle. As someone who is admittedly enamored by the plants, I enjoyed the thick vines and variety of trees almost at much at the temples themselves. We fazed in and out of being too hot to continue on and wanting to see as much as we could, because our time in Cambodia was so limited. At the next stop, which was a sort of makeshift market with souvenir and food vendors, Adam and I ate ice cream cones from a truck before we wandered around to explore more of the vast temple complex. This is where Amy made her way back to us, having found her wallet, the cash was gone but everything else was there. Having sweat out, what I can only imagine was a good portion of my body weight, we decided we were done for the day. Back at the hotel we went to the pool, although Mary and Lee realized for the first time they wouldn’t be able to swim because of their new tattoos. We ordered a light lunch; I got some really yummy spring rolls and washed off my ever-dirty feet next to the pool. After eating we all laid back and read our books and relaxed for a while. I took a short nap before finishing chapter two of Into Thin Air. When we all decided to head back to the room I discovered that my clothes were still not dry. I had rewashed them that morning to fend off the inevitable backpacker mildew but in this humidity they had not surprisingly refused to dry. Amy and Michael came to our room for drinks this time before we headed off to dinner at a popular restaurant someone had recommended. It was nice to have a change from the usual hotel buffet dinner. I ordered something I couldn’t pronounce, nor did I recognize as any western vegetable I had ever seen before. It tasted just all right, but luckily it came with a spinach salad and fried rice that filled me up. I ate way too much, sampling everyone else’s food as well. A step on the hotel scale when we got back confirmed this. I finally took a shower after nearly 3 days. It was the third Hunger Games movie before bed. I had my first really early morning, since Egypt, ahead of me.